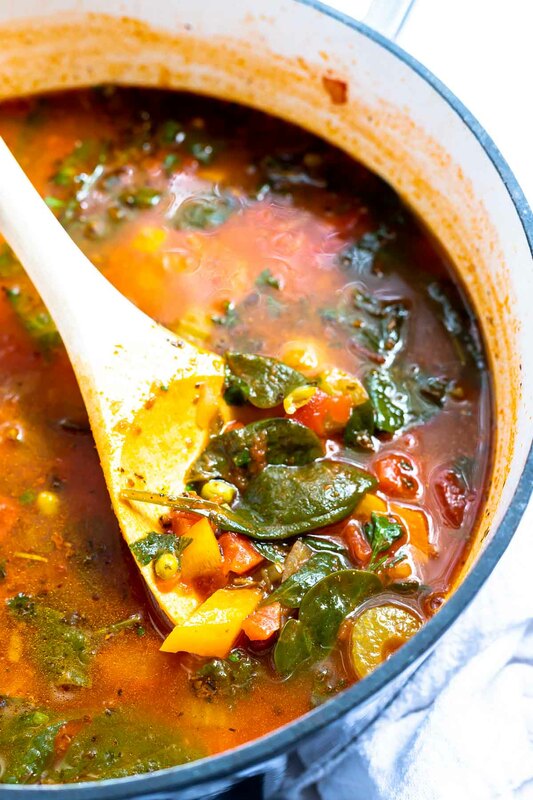 This Easy Vegetable Soup Recipe is great for a healthy dinner idea. 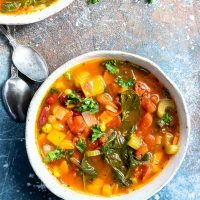 This loaded veggie soup is comfort food at its best in about 30 minutes! This recipe is vegan, vegetarian, gluten free, dairy free and fantastic for meal prepping. Step 1: Sauté onion, celery and bell pepper in oil over medium high heat. Add garlic and sauté 1 minute. Step 2: Add tomatoes, tomato sauce, vegetable stock and water to pot. Reduce heat and simmer for 15 minutes. Step 3: Add beans, corn, peas, carrots and spinach. Simmer 10-15 minutes. Salt pepper to taste and top with fresh parsley. 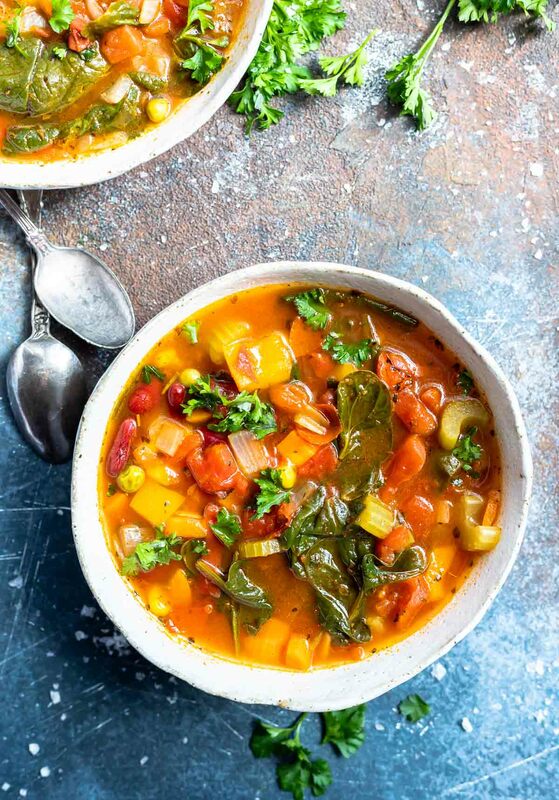 Yes, this soup is loaded with healthy vegetables and packed with nutrients. The great thing about ditching the cans and making homemade soup is that you control the ingredients. No weird preservatives, chemicals or mystery ingredients. Plus, you can adapt this recipe to fit your tastes. Don’t like one of the veggies in this soup? Leave it out. Add more of the veggies that you love or even add your own flavor twist. I’m not going to answer yes to such a broad question. There are so many variables to losing weight and living a healthy lifestyle. I will say that taking homemade vegetable soup as a meal prep lunch instead of ordering fast food is certainly a step in the right direction. 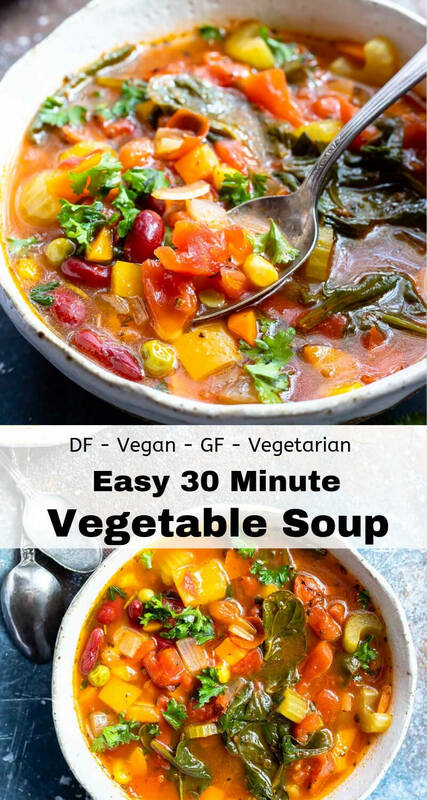 This Easy Vegetable Soup Recipe is great for a healthy dinner idea. 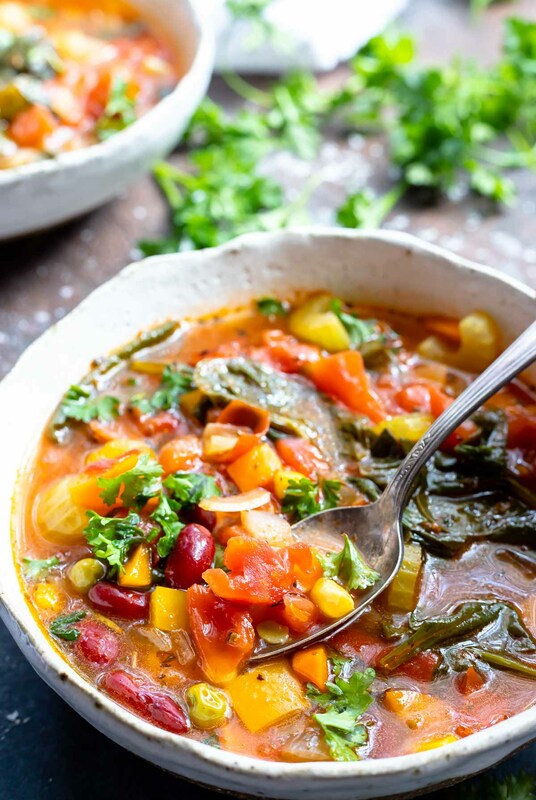 This loaded veggie soup is comfort food at its best. 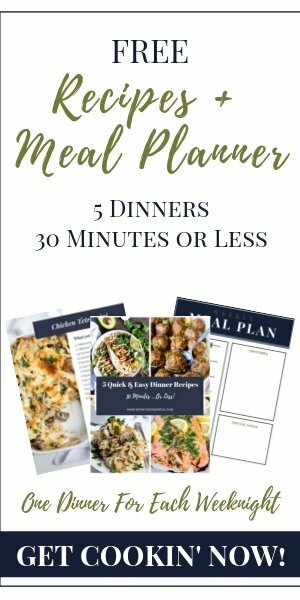 This recipe is vegan, vegetarian, gluten free, dairy free and fantastic for meal prepping. In large soup pot, sauté onion, celery and bell pepper in oil over medium high heat. Add garlic and sauté 1 minute. Add tomatoes, tomato sauce, vegetable stock and water to pot. Reduce heat and simmer for 15 minutes. Add beans, corn, peas, carrots and spinach. Simmer 10-15 minutes. Salt and pepper to taste, top with fresh parsley and serve.